Phew, done! And above, is my very first outfit for the month, wearing an unblogged Felicity Dress Skirt. Zoe also has the first official Me Made May competition up and running on her blog right now! The Fabric Godmother are giving away an amazing prize - a one month subscription to the Dream Wardrobe project kit! To enter, head on over to the Fabric Godmother website, check out their indie pattern selection and let her know, via Zoe's blog, who else you would love to see her stock. So easy and such a fabulous prize. 4 comments on "Me Made Made, and a competition!" Love the sweater. Which pattern is that? 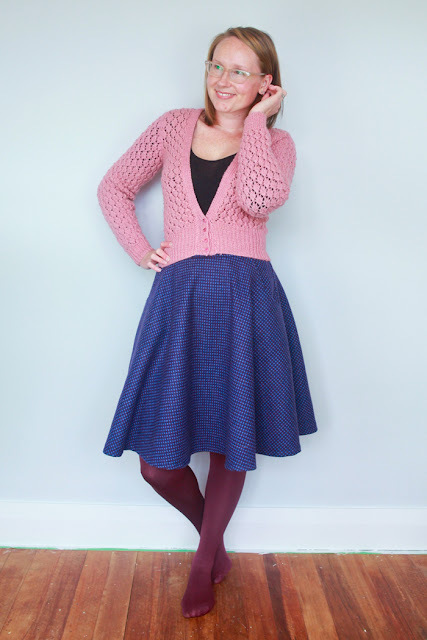 I looked for the pattern for this perfectly styled, cropped cardigan but ended up discovering that you found it in a charity shop! The photo is so teeny I cannot make out the lace pattern. (The stitch seems familiar.) But I will have to "Frankenstein" my own version of this sweater.